Congratulations, Class of 2014! Four years of blood, sweat, and tears, and you’ve made it through your undergraduate years with a shiny new degree in hand! And, um, not to be a downer or anything… but you’re also exiting university with the dubious distinction of being the most indebted class in the history of the universe. Sorry, guys. That blows. I feel for you. Really, I do. Yikes, right? 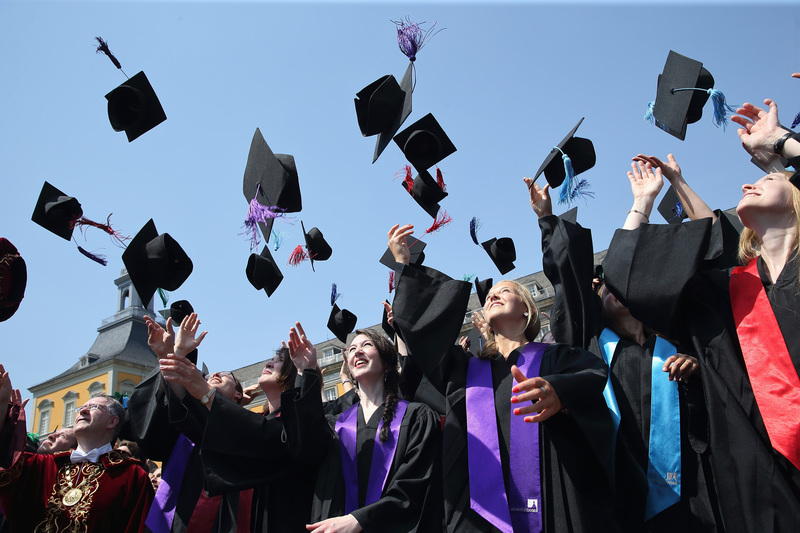 And of course, as both the amount of student debt and the number of graduates attempting to pay it back rises, the question about whether a college degree is worth it becomes more pressing than ever. Back when I was in school, the consensus seemed to be that the bachelor’s for my generation was the equivalent of the high school diploma for my parents’ generation; the master’s degree was the equivalent of the bachelor’s; and so on. It’s still true that in most industries, employees with college degrees earn more than employees without one. The higher the education, the greater the pay advantage — although it also means the greater the debt. If we’re looking solely at numbers, I’d argue that the answer to whether it’s worth it is a little more complicated than simply “yes” or “no.” The WSJ notes that in 2012, workers with a bachelor’s degree were making a median salary of $46,900 a year, while the average student loan balance for people younger than 30 was $21,400; according to these numbers, then, it looks like most former students are making enough to pay back their debts. But there a number of problems, too: Between 2005 and 2012, the average student loan debts has risen 35 percent, while the median salary has dropped by 2.2 percent, which means the gap between debt and salary is growing. See that ever-widening funnel? It’s giving me major anxiety just looking at it. Furthermore, unemployment is still a major issue — a huge number of college graduates don’t have jobs waiting for them when they leave school (architecture majors seem to have it the worst: Their unemployment rate is a whopping 12.8 percent). And it’s not that they’re unqualified or anything; it’s just because the job market is still pretty abysmal. Add to that how expensive the city you live in is, and, well… you can see how thorny it starts to get. But even in spite of the numbers, I’m still inclined to say that yes, it is worth it to get a college degree. As I’ve commented before, I think college teaches you a huge variety of life skills beyond what you can list on a piece of paper: How to manage your time, how to manage stress, how to work as a team player as well as independently, how to think outside the box, and so on and so forth. Furthermore, you get what you put in, so if you tell yourself going into it that you’re going to get the most out of it you possibly can, then you’ll pick up loads of useful things while you’re there. Yes, I’m lucky in the fact that I have a job and that debt isn’t a problem for me. But I also think that my ability to handle the period when I was unemployed had a good deal to do with what I learned in school. Maybe that’s just me, though. People wiser than I have gone on at length about what’s wrong with the economy and how we might begin to fix it, so maybe the proverbial light is, in fact, there at the end of the tunnel. That light might be a long way off, but hopefully we’ll get there one day. And when we do, I’d much rather be there with a college degree in hand than not.